A fresh and definitive portrait of the Master of Suspense by acclaimed biographer Patrick McGilligan. Full of fresh revelations, dark humour and cliff hanging suspense, this new biography of Alfred Hitchcock follows his life from its humble beginnings, as the son of an East End greengrocer, through an extraordinary career in which his films set new standards for cinematic invention, to his death as a Hollywood legend in Beverley Hills. Covers Hitchcock's relationships with Hollywood screen legends such as Cary Grant, James Stewart, Ingrid Bergman and Grace Kelly. Director Hitchcock is in a class by himself. His legendary films, including "Rear Window", "The 39 Steps" and "Notorious", coupled with his TV show, "Alfred Hitchcock Presents", aired his singular brand of evil and salvation. In this enthralling, scholarly and candid appraisal of the artist, McGilligan, a biographer of James Cagney and Jack Nicholson, neatly reveals the man behind the camera. A quiet Catholic boy from London's East End, Hitchcock (1899-1980) began as a production designer on silent films and eventually became Britain's premier movie director. David O Selznick tapped him for Hollywood, and although their relationship was stormy, it spelled success. Hitchcock, who claimed, "I'm not interested in logic, I'm interested in effect," quickly redefined the medium. He told his stories visually, invented innovative camera angles and reveled in suspense tales. Always, he was aided by his wife, Alma, an invaluable partner on every project. 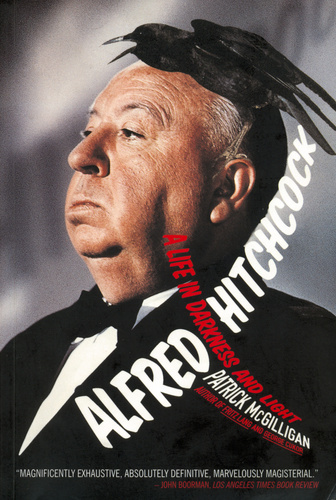 A Hitchcock film "characteristically mingled light with darkness," possibly because its creator was so conflicted. Hitchcock adored gossip, dirty jokes and icy blondes, though, sexually impotent, he could not consummate his desire; his voyeurism instead played out on screen. He relished the occasional cruelty, but it did not obscure his genius or his generosity. He worked tirelessly for the British war effort, though America was committed to neutrality until Pearl Harbor, and was deeply loyal to old friends. McGilligan has crafted an inside look at this unique director and the studio machinations that sustained him. Film buffs will relish how power and creativity play out in Hollywood. The rest will learn how obsession can produce art. — Publishers Weekly, (c) 2003 Reed Business Information, Inc.